As my witchy friends know, I do love a cackle from time to time, so when I passed a sign to Cackle Street I had to go and investigate. 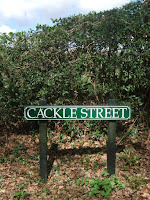 Cackle Street is actually a country road in the village of Nutley, in East Sussex, on the edge of the Ashdown Forest - which was where I was heading before taking a detour to quest for a place with such a witchy name. Later I tried to do some research into how it got that name, but didn't find out. 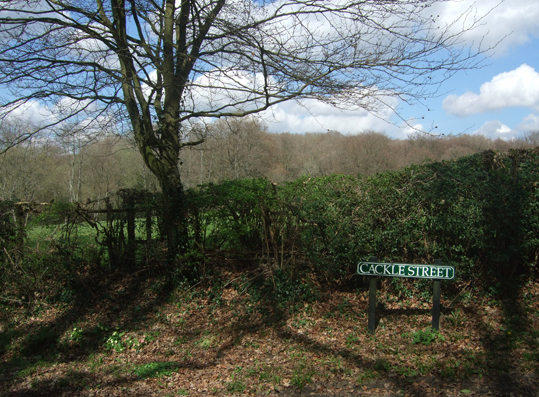 According to a pdf I found online called Nutley Village Design Statement 2006, written by residents trying to make sure any new buildings in the area weren't eyesores, Cackle Street lies on the eastern side of the village and "passes through the Forest, linking the village to Fairwarp in the east". Like most of the other lanes and roads in Nutley, Cackle Lane passes by fields and trees. It is bordered by hedgerows and grassy banks with a few picturesque cottages. Apparently Author Neil Gaiman lived in Nutley between 1987 and 1992, and his house there became the setting for his book Coraline. I'm not sure if he lived near Cackle Street though. 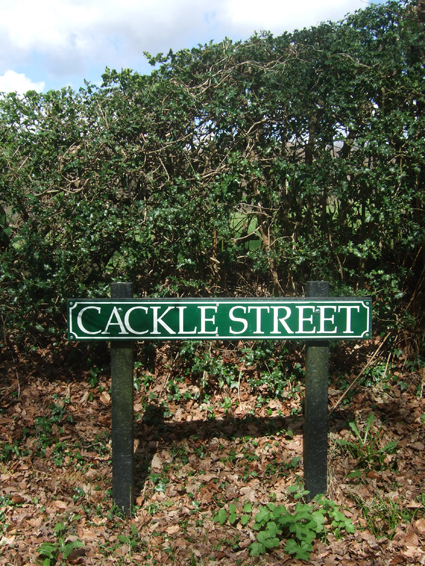 According to The Hastings Chronicle, there was once a Cackle Street in Hastings, but in 1904, "Hastings Council renamed Cackle Street as Frederick Road, in honour of Alderman Frederick Tuppenney, chairman of the workshop’s [sic] board of guardians, who had been the driving force in building the new extension to the workhouse." The word cackle apparently means the sound a hen makes after laying an egg - as well as meaning a loud laugh, of course. Maybe at one time there were poultry farms in the area of Nutley? I just don't know. 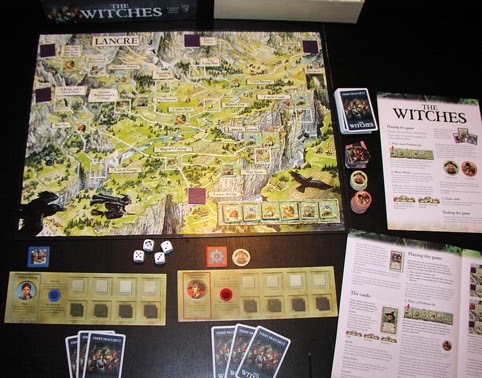 The idea of witches getting together for a good cackle also reminds me of Terry Pratchett The Witches Boardgame, which I really like. 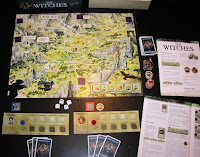 One of the game mechanics involves getting together with the other witches - played by the other players - to have a cackle in order to mitigate the effects of things going wrong. Laughter is one of the most powerful forms of magic and can really make you feel better when life is tough. 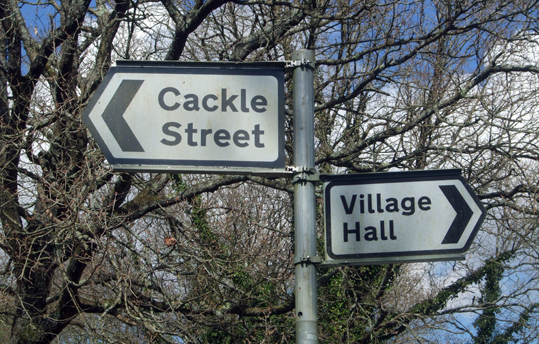 And if you happen to know the origin or meaning of Cackle Street's name, do leave a comment.